This week I made some commits to a personal project of mine, NakedPhp, which aims to produce an implementation of the Naked Objects pattern (direct manipulation of domain objects via a generated user interface). It's quite nice to see that I was able to resume coding immediately thanks to the project's test suite, which covers both the acceptance and the unit levels. 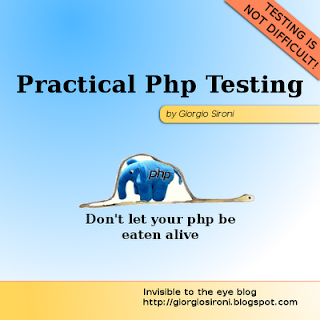 Tests are one of the best example of documentation you can maintain without hassle. Here are my original articles for the past week. How to be a worse programmer, which has gained 17,000 views at the time of this writing. Thank you for introducing NO in a php fashion! Just downloaded the source and will have a look at it this weekend. Hope you like the idea - the example application gets to manage CRUD operations on objects and *-to-one relationships for now.